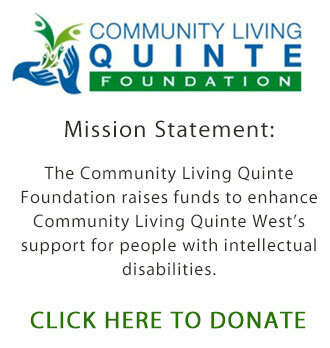 Community Living Quinte West is a not-for-profit organization that offers adults with intellectual disabilities a chance to learn, grow, and participate like everyone else in their community. We have many programs and locations where volunteers are welcome. For more information on the agency please click on the CLQW Brochure link below. Volunteers are our greatest resource. Volunteers are an important community connection and help to enhance our programs. There are a variety of opportunities available for volunteering within our programs. The Compass program provides a variety of learning experiences in a group environment for people with intellectual disabilities. Activities are designed to meet the needs ad desires of the individuals participating. Volunteers may work one on one with an individual or in a group. Volunteers also have the opportunity to lead an activity based on their own skills and knowledge. The Supported Independent Living Program offers individuals living on their own the chance to live as independently as possible within their communities. The program’s main focus is to provide assistance to people in the SIL program with daily living skills such as shopping, keeping appointments, and recreational activities, as they request. Volunteers can assist with any of these activities. The Residential Living Program provides a home environment in a group setting for adults with an intellectual disability. Support is provided 24/7 so that individuals may become active members of their community. Volunteer opportunities include spending time with an individual or participating in a group activity. Volunteers are always welcome at the Administration Office. The management staff enjoy working with volunteers. Opportunities for volunteers include answering the telephone, data entering, forms designing, and assisting with publishing the newsletter. CLQW is governed by a volunteer Board of Directors responsible for setting policy, direction, and fundraising for the organization. Volunteers can apply to serve on the Board and members are elected for a two year term. If you wish to volunteer with Community Living Quinte West, please download and complete the following form and send it in to us. Please note that you will need Adobe Acrobat Reader to view the form and print it. If you have any problems or need more information please call Chastity Nicholson at 613-394-2222.